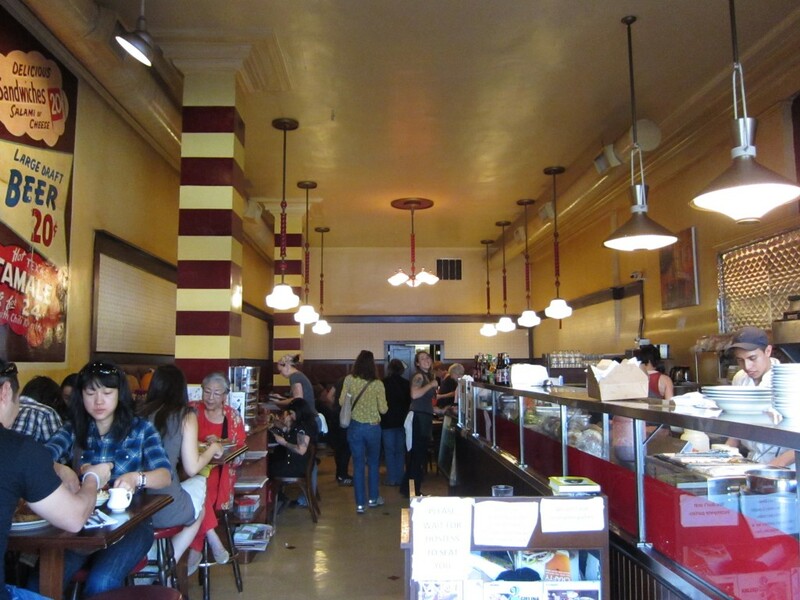 Downtown Los Angeles is full of history and good food. 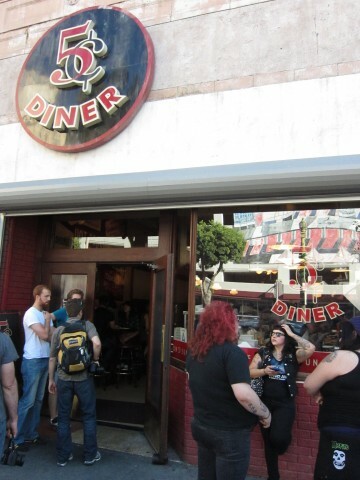 Nickel Diner is popular amongst the urbanites as a breakfast spot, though they serve lunch and dinner as well. Located in the heart of Downtown Los Angeles, and neighboring the Skid Row Housing Trust, the atmosphere can cause a bit off-putting. Anyone not used to Los Angeles might a bit turned off by the transients and solicitors. But come on – you are in Downtown. This is my city, and I love it. The buildings a bit worn and the sign is ancient, but once you enter, it is a whole different story. They offer burgers as well as breakfast items. What they are known for, more so, are their bacon maple donuts. 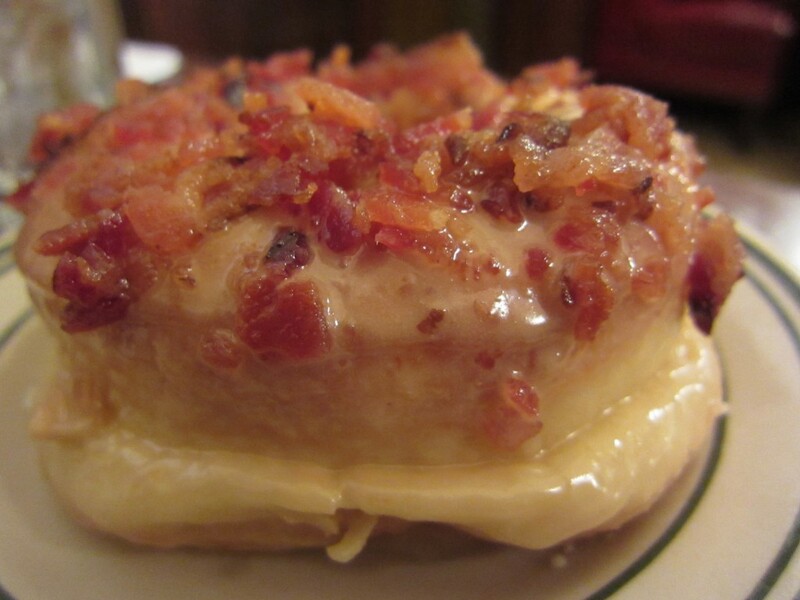 Bacon on top of a maple donut, that is indigence upon indulgence. It didn’t surprise me when I ate the bacon maple donut first. More so a dessert item, I figured the bacon on it gave it enough of savory status to make it an appetizer. Never having tried it before, it was a novelty. The taste though worked. Bacon with pancakes and syrup immediately came to mind. The sweet and savory really worked, though I would have liked the bacon to be crispy. It was a great start to my Nickel Diner experience. I heard much rave about their mac and cheese. I am on the never ending hunt for the best mac and cheese in Los Angeles, so ordering was a must. 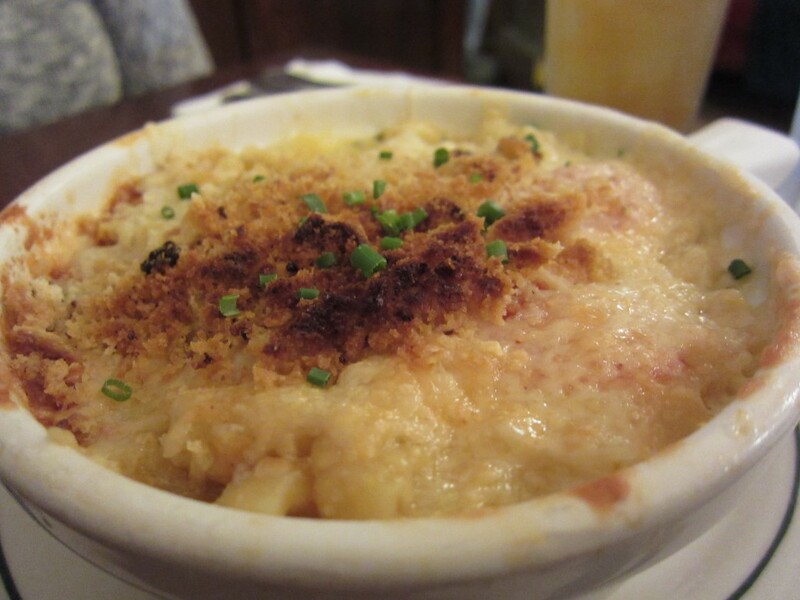 Theirs, named Smac and Cheese came with roasted tomatoes and bread crumbs on top. The top layer was crispy and crunchy, and the inside was piping hot. After a bit of cooling off, the cheese and noodle concoction was tasty. It wasn’t creamy really, but it was cheesy it its own way. I ordered the Hangover Helper, and no, I did not have a hangover. A play on the hamburger helper, this dish had everything you can ask for in one pile. 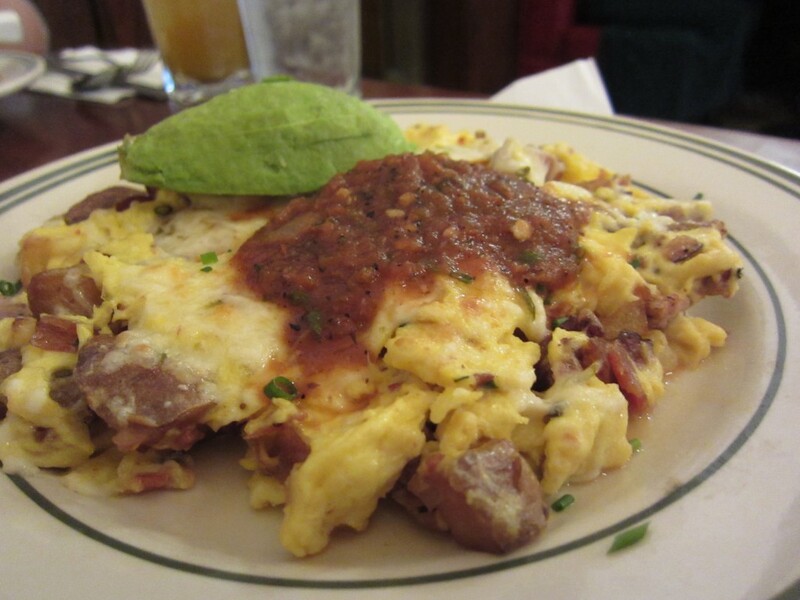 The pile included scrambled eggs, bacon, Italian sausage, potatoes,and was topped with pepper jack cheese, avocado, and salsa. Yeah, that is a lot of stuff all on one plate — delicious too. My favorite though, was the salsa. Something about the salsa on top was addicting. It rounded out the meats and cheese very nicely. Without that salsa, this dish would have been missing something. My Nickel Diner experience was a pleasant one. The food was on point, and the bacon maple donut was memorable. It was nice to have breakfast in Downtown as there aren’t too many places to choose from. Looking at the buildings and absorbing the history of Downtown Los Angeles was comforting. Locals living inside Downtown are lucky to have such a down to earth establishment inside the city. A little spot on Diners Drivers and Dives. Here is the clip. That doughnut looks so amazingly delicious I might just have to end up in LA just to have it… How far is this place from the convention center? Hey Dan! It isn’t too far. 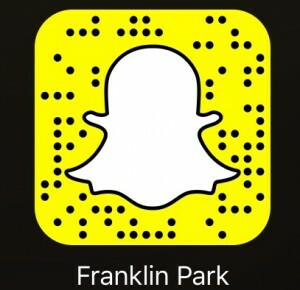 It’s pretty much in downtown on Main St. You should check it out.